My daughter surprised me with this request last week. During the Baltimore winter, nobody in the family walks together—even the dog doesn’t want to be out more than five minutes. While Maryland winters are not fierce like the seasons I spent in Minnesota, they are still cold. There are always a few snowfalls and a cold wind blowing off the Atlantic. The difference between winter in Maryland and other places is that the damp wind can chill you to the bones. February is a good month for making soup. It certainly hasn’t been the usual kind of February. Last December, meteorologists predicted this would be another warm winter, just like 2016. The forces at work were an especially strong El Nino wind and an Arctic Oscillation, a stream of winds above Canada and Alaska that has chosen to trap the cold weather far to the north of us. 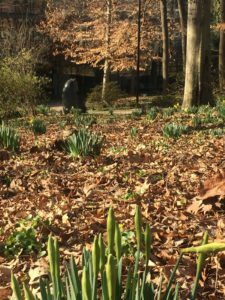 The US Geological Survey says spring arrived to the Washington DC area 22 days early. I’m not ready to say that we are in spring (official date of Spring Equinox is March 20). In Baltimore—an hour’s drive from DC—this winter brought only a slight, powdered-sugar style dusting of snow: less than an inch. 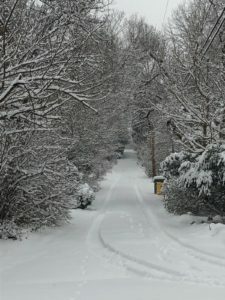 The mountainous areas in Western Maryland where people ski had a tremendous melt of the small amount of snow that fell. The ski resorts are all but closed up for the season, when they ordinarily would have had business for at least another month. It’s weird. Just like the active calls of birds to each other, seeking mates, just a little bit too early. When I say this is a hot winter, I mean that it’s been like California on many days. My husband, perhaps out of loyalty to his birthplace, says it’s a “New Orleans winter.” Instead of the typical temperatures in the 30s, it’s been in the 60s and 70s Fahrenheit for many days in the past weeks. It reached 77 last Friday when I went walking with the dog and my daughter. 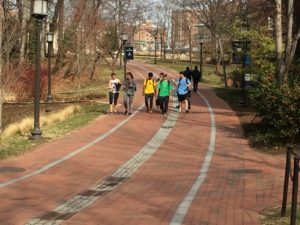 At Johns Hopkins, the school set up signs encouraging students to practice mindfulness while outdoors. 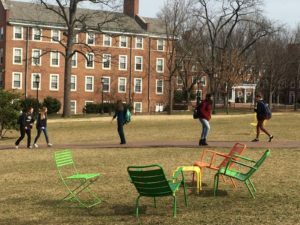 The staff arranged beach chairs to encourage meditating in nature, but the Hopkins students seemed more intent on getting to class. No time to sit and sun oneself at Hopkins! For me, the national news has been so chilling, that the warm weather gives me a sort of fragile happiness—the feeling that life still is good. Walking in nature is good for mental health, as well as physical. I invited my husband to walk with me last Sunday afternoon and we took a 45 minute stroll through the neighborhood. 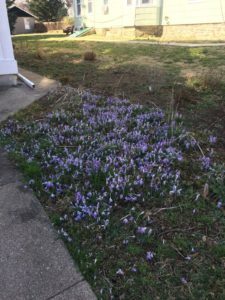 Crocus in February are par for the course. 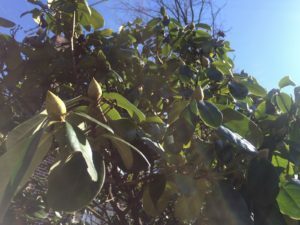 However, we saw sights we would normally not see for a month: magnolia trees in bud, and pink hellebores in bloom. 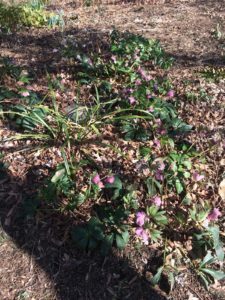 I planted a few hundred bulbs in my own garden around Thanksgiving week, and they are starting to show their faces. That seems hardly enough time underground to get their roots established. Apparently Japanese apricot trees and some early-blooming cherry trees are already in flower. I’m worried that a cold snap will kill the display; just as I feel nervous for any birds laying eggs. I also wonder what might happen if birds and rabbits decide to procreate early. Could their eggs survive a freeze? My fingers are crossed that the steamy early spring will not lead to a silent spring later on.